Andreas Cellarius was a 17th Century German scholar and map maker. His 1661 text, the Harmonia Macrocosmica, illustrated the theories and philosophies on the science of stellar and planetary movement that were debated during the Renaissance period. Stag’s Leap Wine Cellars owns a set of nine of the engravings. Highly detailed, the artist created works that manage to be both precise in their presentation of the theories of the day, and strikingly beautiful. 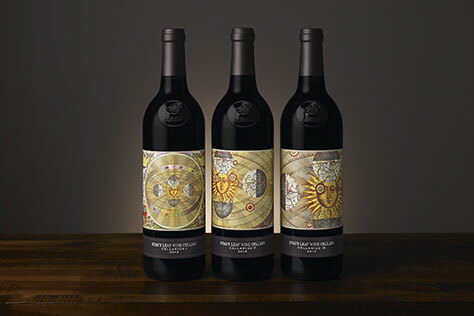 The Cellarius Series pays tribute to Andreas Cellarius by seeking to map Napa Valley throughout three unique perspectives on a winemaking theme, and features a different engraving each vintage. In 2013, our winemaking team explored three different trellising systems in the FAY vineyard. These wines are 100% Cabernet Sauvignon from the same vineyard, but demonstrate the differences in how the trellising system contributes to the flavor and textures of the wine. The 2013 labels feature Cellarius’ Plate 5, which illustrates scenography of the Copernican world system. Featuring Moser trellising for silkier tannins and red fruit flavors. Offers generous aromas of spicy red fruit, boysenberry, fig, and a touch of chocolate, tobacco and cedar. Soft and round on the mid-palate. Finishes with hints of licorice, vanilla and sweet oak. Food Pairings: Enjoy with filet mignon with red wine demi-glace, duck confit or grilled Portobello mushrooms tossed in olive oil with fresh rosemary. Cane pruned vines create variability in fruit development for complex flavors. Bing cherry, cranberry, cinnamon and sage aromas with a touch of olive and strawberry. A bright and elegant texture with complex earthy notes that lead to a soft finish with hints of cherry. Food Pairings: Enjoy this hearty wine with rack of lamb with dried sage, pork tenderloin with wild mushrooms or risotto cakes with Fontina cheese. Traditional cordons growing vertically create darker ripe fruit flavors and powerful tannins Opens with aromas of blackberry, dried herb, black tea and currant. A bigger texture full of ripe fruit and hints of oak leading to a rich finish. Food Pairings: Try pairing this Cabernet Sauvignon with grilled rib-eye with roasted mushrooms or Tagliatelle with short rib ragu. For the wine lover who enjoys variety. 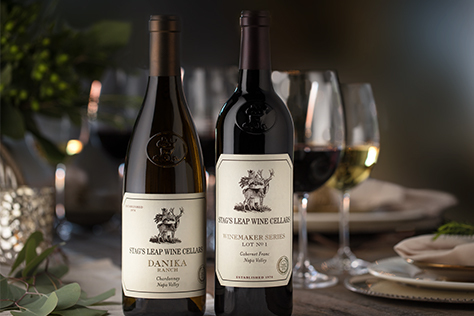 One bottle each of our 2014 DANIKA RANCH Chardonnay and our 2012 WINEMAKER SERIES Cabernet Franc, both from Napa Valley, in a kraft gift box.